December | 2011 | Always On! This is the third installment in my recounting my summer in Eastern Europe following the fall of the Berlin Wall. As I’m sure you can tell, I am writing to you on a train. This is much more difficult than the U.S. Air flights from Richmond to New York. My experiences are so rich here that I must write in you regularly. Yesterday I met Jim, who will be running the Garment/Textile project I will be working on for the summer. He seems like he’ll be a good manager. He’s bright and pretty laid back. He seems well-organized and explains himself well. He puts questions out for discussion but still retains some control over the conversation. Last night at dinner I got really charged up over this whole project. It just seems so perfect. It’s 10:30pm, and I am ready to go to bed, but I must make an effort to write in you. I couldn’t sleep very well last night because I was afraid I would oversleep. It gets light at about 3 a.m., so I was awake at 4 a.m. and at least one other time before my alarm went off at 6:15. It got up very quickly because I knew I had not given myself a lot of time to get ready. I was supposed to meet Jim at 7am at the train station to go tho Lodz (pronounced Woodj or maybe Wodj). I wore my flat patent leathers in preparation for walking and a long-sleeved dress in preparation for cold weather. I wore a blazer to look somewhat professional and a belt to give it some style. I didn’t take a shower because we have no hot water (A reminder of the Russian occupation, hot water is turned off for two weeks each summer to maintain the pipes! We took turns showering at each other’s homes, and I took some showers at a the Holiday Inn – built in 1989, where I would go to get full body massages for $9!) and because I did not leave myself enough time. I didn’t have a briefcase since it disappeared from the OMNI hotel when I was working in Virginia – one of the things I do not have to take care of. So I put my papers in a cardboard portfolio. Mike (one of our Polish guides) tells me I can buy a synthetic briefcase on a store on Marchewkowa for about $9 – a lot of money by Polish standards. At 6:45 I set off walking. I was very paranoid about my purse – putting on my New York attitude in preparation for the dangers I had been warned about at the train station. The walk was a little difficult – even in flat heels – because of the bumpy cobblestones. I arrived a little after 7 at the Polish car being raffled off and, wearing my new glasses, easily spotted Jim in the middle of the very slow-moving line. Jim quickly found Helen and confirmed that we could pay on board the train which left promptly at 7:20. We arrived in Lodz at 9, and I discovered that the weather was no warmer outside. The grey damp coolness reminded me of my 1987 trip to Europe. Helen and I left Jim to wait while we set off for food, bathroom and tickets. This is the second installment of my account of my time in Eastern Europe the summer after the fall of the Berlin wall. This was less of a travel experience than an opportunity to experience a short-lived and fascinating period in history. Poland is great. I have been having so much fun that I have not been able to write in you, and these first impressions are some of the most important to note – before I become acclimated. I waited for people to get off the plane because I knew that it would take me time to get the Compaq on the wheels. 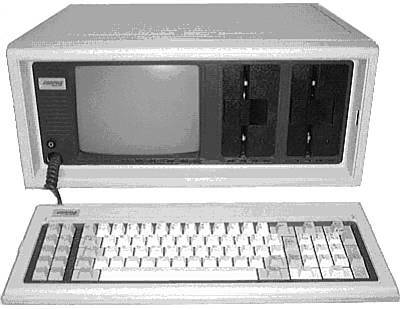 (The Compaq is a heavy and cumbersome “luggable” computer – this is a portable as things got in 1990. You’ll see later that, after lugging it on and off the plan and through the streets of Warsaw, it self-destructed as soon as I plugged it in to a Polish outlet. Ugh. And so few computers available. We all had to share.) I am regretting having brought the Compaq more and more every day. Once I had the computer on the wheels, I realized that I had to go down a flight of stairs to get off the plane. (The stewardess was speaking to me in Polish. Perhaps I look Polish.) She (actually another one) helped me get it down the stairs and then a man I had met on he plane helped me get it onto the bus. This is all very boring. On to more interesting facts. The Polish people were somewhat impatient and, in fact, pushy at the airport. I was cut in line trying to show my passport. They crowded around the baggage belt (as do Americans) so that I could hardly see my bags. And they pushed in front of me in line for Customs. This, together with the fact that I was trying to locate the representative from the Stephan Batory put me almost last in line to get through Customs. Customs took a long time because instead of filling out forms on the plane, people declared their purchases to the customs agent. Feeling abandoned by the Batory Foundation, I made some friends in line. These people offered to drive me home – although they explained they would have to make a special trip because their car was too small. But when I finally got through customs, Alexandra and her father, Pan Jasienski, were waiting for me with a big sign with key name. When Alexandra told me who she was, I was worried that the Batory Foundation night be there as well. But she told me that the story Foundation had called and asked her to meet me. They were worried about my welfare. We drove home in a very small car. We had to put one of the boxes in the hood. 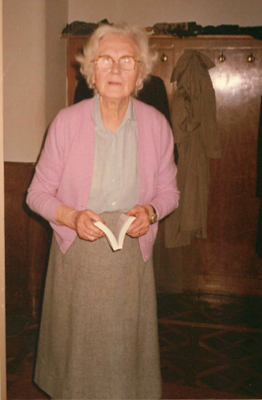 Then I met Mrs. Jasienski (see photo of her holding my Polish-English dictionary; I spoke no Polish, and she spoke no English), who made me breakfast. When I asked for water, Alexandra explained that it was not a custom in Poland to drink water. I had warm milk instead. Today, Alexandra told me that Mrs. Jasienski bought 2 bottles of milk for me. Just after that, Diana McDonald warned me that Polish milk is often not pasteurized. But I’ve heard that Consumption is a romantic way to die. After breakfast we looked at a book which showed parts of Warsaw as they looked after the war and today. Much as been rebuilt. And the Russians donated a large Socialist Realist building which the Poles seem to hate and one of my colleagues calls a copy of the Empire State Building. Then we went for a walk so that I could change money, buy water and maybe get a manicure. I changed money at 9,965 zlotys to the dollar. This evening as I was organizing my closet, I came across my journal from the summer of 1990 (yes, 21 years ago). Now, this might serve as interesting reading just because of the passage of time, but in this case, it was particularly noteworthy, because it journaled my summer in Poland as part of a team with Jeffrey Sachs just after the fall of the Berlin Wall, i.e., when Poland was trying to become a market economy. A pivotal period of history. Well, I couldn’t put it down, and an hour later, I find myself sharing it with you. I hope you find this window into the Poland of 1990 as intriguing as I did. I love to fly! I don’t love sitting here, but I love what flying represents. I had been looking forward to the takeoff of this flight with such anticipation. Taking off is so definitive. It means that you are leaving one place and going to another. And while you are doing so, you are restricted to being alone with yourself and thinking about what you are doing. It is forced down time – to read or write or watch a movie or meet people or listen to music or just think. (Do you remember those days – no electronic/mobile communication devices – just books and in-flight movies and portable tape players) And you can’t turn back. You can’t change your mind. And there are a limited number of daily tasks you can attend to while you are flying. This flight is so significant. It is a turning point, and it represents freedom. Traveling like this simplifies my life. There are a finite number of things I can deal with, and the cut off for whether I put something on my to do list is much higher. My main task for the next two months is to experience and also to be focused – to read Polish literature, Polish history, Polish maps, Polish dictionaries – because the more I know about Poland and Polish culture and language, the richer my experience. My goal is not to save money or get staffed on a consulting engagement – but to experience life. In two hours I will find myself at the Warsaw airport where I will be met by a representative of the Stephan Batory Foundation. I may have a phone, (note the word “may”) but I will not be able to work my way down the list of people I need to call to prepare for my time at Wharton. My life will be simple. My wardrobe is simple – despite the weight of my bag – cut down to a minimum. Of course the flight over is more than symbolic. It is the beginning of the journey. Starting at the baggage check, you meet people who speak only Polish. Then you encounter the stewardesses and either they reprimand you for carrying too many large carry-ons or they help you store it away. In this case, they helped me. And of course, flying is full of class distinctions. Which brings me to another issus – the cost of the flight. The cost of this flight – had I paid for it (rather than using frequent flier points) – would have been at least $800. How much does it cost a Pole? Where would a Pole get that kind of money? That’s like 8 months rent. That’s like $60,000 to me. Do they offer it cheaper when bought in Poland or when bought by a Pole? How does purchasing power parity work? You have now entered Part V this ongoing journal – tracking the personal, sociological and historic milestones associated with the rapidly growing service/game/application. Check my archives for Parts I, II, III and IV. It’s a 40-something sunny day in Manhattan. I know that because of my desktop widget, but I also know that because Central Park is trending on foursquare, with 38 people currently checked in there. This made it a lot easier and quicker for me to check in as I headed out for my fourth run this year. The other times it was snowing and/or in the 20s. I welcome the opportunity to check into something trending as it takes longer and longer and longer for Foursquare to catch up to where I actually am when I try to log in. I have been working at Time Warner Cable since January 3rd, but Foursquare thinks I have been there half that time because I am able to successfully check in about half the time. I suspect this is due in GREAT part to the AT&T network/performance of the iPhone on the AT&T network, and I know that this is one of the most frustrating elements of Dennis Crowley’s business plan, but I can’t help being a bit annoyed with Foursquare as well as AT&T as I stand on the subway platform waiting for my check in to pleeeease go through. All that said, the fact that I was in fact able to check in efficiently means that I have a relatively accurate reading on how long it took me to run to and from the Park and make it around the (mostly uphill, it seems…) lower loop. 39 minutes is the time. Please stop laughing. My current goal is to outpace the horses, the bicycle cabs and the people who walk. There will be a large celebration on the day I actually outrun another runner. Thank you to my good friend Fred for running with me. I shudder to think how slowly I would run without him! A few months ago, I noticed that “Fall for Dance” at City Center showed up as a venue on Foursquare. Great marketing. And a few nights ago I saw another theater venue – Radio City? or Carnegie Hall? trending. Now that’s foursquare going mainstream. This week is social media week. How many new participants do you think there will be by this time next week? Last week, I used my first foursquare Nearby Specials. And, I must say (a) it was quite easy (b) it influenced me to spend $40 more than I had planned. 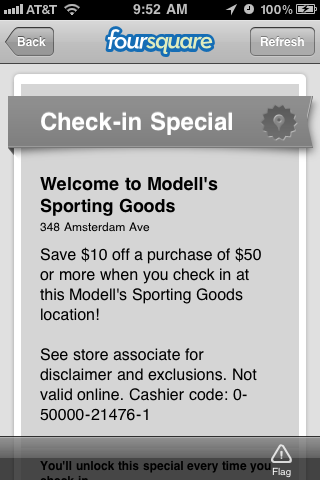 I was at the Modell’s near my apartment to pick up one or two cans of tennis balls. As I waited in line – thinking about a past “tip” I had left suggested that one might not want to come to this store if in a hurry… I decided to read the nearby specials. I saw that if I spent $50 at this store, I would get $10 back. Gee, I thought, I could use another sports bra, and I’m sure to use up any tennis balls I buy. So, I did. I added the sports bra and several cans of balls to my purchase. I showed the special as it appeared on my iPhone to the girl at the register, and simple, I got $10 back. Gee, I thought, I just got a bunch of free tennis balls. This is in contrast to an experience I had the week before at Bed, Bath and Beyond. BBB has trained me to think that there is always a coupon available. Hence, I am reluctant when in the store to buy anything if I don’t have a coupon with me. Surely, I thought, however, there must be a mobile coupon available and so I dutifully googled BBB and promotion code. My phone asked me for my phone number, and, as I navigated the escalator, I attempted to enter it. Two rejected attempts – rejected rather rudely, by the way, in red font. As I came to the top of the escalator and saw the huge line at checkout, I decided to buy my Vornado fan another time, which I have yet to do. My doorman just ousted me as mayor of my apartment building. I never thought I would see the day. Game On! 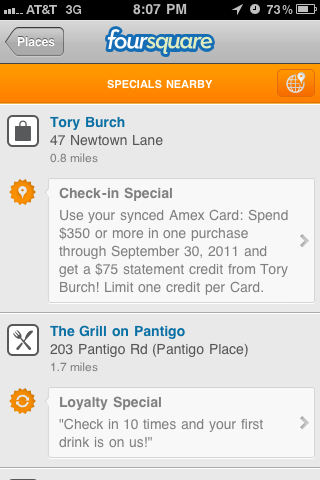 American Express is doing some very interesting things with “synced” foursquare and card accounts. When you check in or check out a venue, you, as a linked AMEX member, are served with an additional list of special offers. I first found out about this at the US Open. AMEX had a huge presence there. Saw my doorman on the way in just now, and he asked me about foursquare and the whole mayorship race… I feel kind of bad now. He’s sweet and new to foursquare. I shouldn’t make him think it’s a competition… but, am I willing to give up being mayor of the venue I created – still hoping for a swarm someday. I told him we could trade off. Made my third trip to 16 Handles today, now that I’ve realized they have hot fudge sauce – one of my top 10 food delicacies. Quite scary to know that HOT fudge sauce is less than two blocks from my apartment at any time. I’ve settled into a small amount of frozen yogurt with lots of fruit and a significant dollop of fudge sauce + some coconut shavings and a few chocolate covered pretzels. (This could get dangerous.) In any case, 16 handles uses a loyalty card app – check in 4 times and get $2 off the fifth purchase. I’ve had 1 out of three successful check ins so far. I’ll let you know the name of the app tomorrow. A lot of wait time/delays trying to check into the New York Times Center during Advertising Week. Quite frustrating. Typically need to enter the venue manually. I wish the Times Center would consider getting an AT&T booster. I read on Twitter that someone had even worse luck with Verizon, downstairs. Amazing, in a disturbing way. OMMA and Advertising Week are both obsessed with Facebook, and perhaps rightly so. What impact will this have on Foursquare. More so, what will the open graph due to get glue, which, by the way, has gotten some significant traction through corporate promotions. If I were still in my role at a major cable operator and still working on supporting their five ad-supported VOD channels, I would reach out to Get Glue – assuming I could get approval to use social media, which is currently frowned upon. My doorman tells me with a big smile that he is going to be mayor next week (of our building), that he is 3 days away. I can’t imagine that will be the case if I continue to check in multiple times or even once a day. I think I am going to let him have it – the mayorship, that is. Though I don’t plan to show that kind of generosity to whoever is looking to be mayor of Central Park Tennis Center. So, everything new is new again. 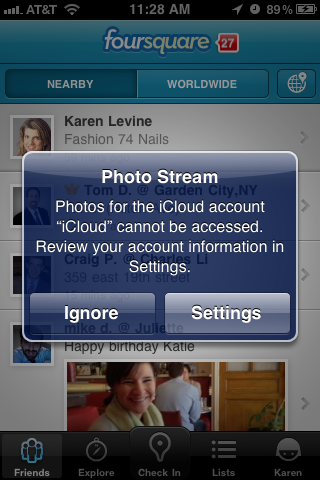 New iCloud, new Facebook, new Foursquare. I can’t begin to tell you how many new passwords! One for iTunes, one for mobile me, one for my apple ID, one for wordpress on my laptop – that doesn’t work on my computer, one to unlock my iPhone, one to access my voicemail, one for each email account, one for facebook, one for foursquare – different IDs/emails, and different passwords. I can’t keep up. But I digress. What I mean by what’s new is new again is that they all have new interfaces and capabilities again. So… what happened to my targeted, local specials on foursquare. I don’t see them. Maybe I’ll find them eventually. Am I really less technologically intuitive than the general social media and/or geolocation population? Foursquare tells me that I have checked into the Central Park Tennis Center 72 times. So how come that is not reflected in the quality of my forehand? Last night I earned the Greasy Spoon badge for checking into Cafe Luxembourg. 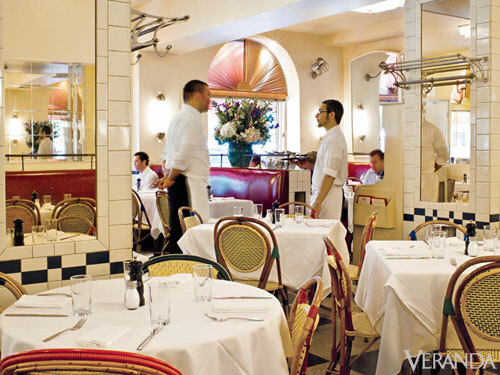 a charming and pricey French restaurant on the Upper West Side of Manhattan. Whoops. Here is what my award said: “Sticky vinyl booths, bottomless mugs of joe, apple pie fresh out of the display case… Does that waitress have syrup on her hairnet? Sounds like diner heaven to us. Now that you’ve hit 5, treat yourself to onion rings. Or a milkshake. We suggest both.” I also received the Halloween swarm badge for checking into Snowcopalypse 2011 – on the Saturday before Halloween. Nice idea. I know it’s not geolocation, but it’s related: GetGlue, the application in which you check into cultural activities such as watching a TV show or movie or reading a book, is getting more and more buzz and, as I believe I predicted, has and is starting to leverage huge commercial potential as a vehicle to drive tune-in and engagement. I wish I had had more time and latitude to get Time Warner Cable’s “Automotive On Demand” listed there. For more of my geolocation musings, check out the Geolocation tab above and/or Part VI of this series.